Oreo has quite a track record when it comes to concocting unconventional and bold new variations of its iconic sandwich cookies, but it's gone a decidedly different and downright strange direction with its latest offerings. The makers of the cookie aisle staple just unleashed two new flavors in China that stray far from sweet and land decidedly in savory and spicy territory: Hot Chicken Wing and Wasabi. 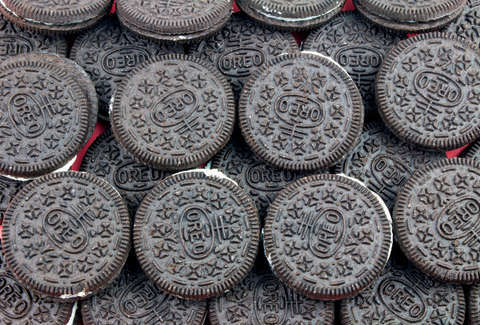 The parent company behind Oreo, Mondelēz International, recently announced the pair of new flavors in a tweet. Hot Chicken Wing features a Buffalo Sauce-esque orange cream, while Wasabi's is, well, wasabi green. Both appear to feature chocolate cookies (a questionable combo, if you ask us). While previous flavors like Marshmallow Peep, Swedish Fish, and Firework are good examples of Oreo's free-wheeling approach to putting crazy new cookies on the market, you have to wonder what exactly they were thinking with these. Mondelēz International hasn't commented on whether they plan to expand availability for either of the spicy new offerings beyond China, so if you're dying to see how your taste buds react to them you may have to book a trip there. Naturally, the Hot Chicken Wing and Wasabi cookies have provoked some rather intense reaction on the internet, and several people have taken to Twitter to voice their feelings. Needless to say, the skepticism is palpable. But then again, who knows, maybe they're delicious?